Thank you to our partners for sponsoring this post. 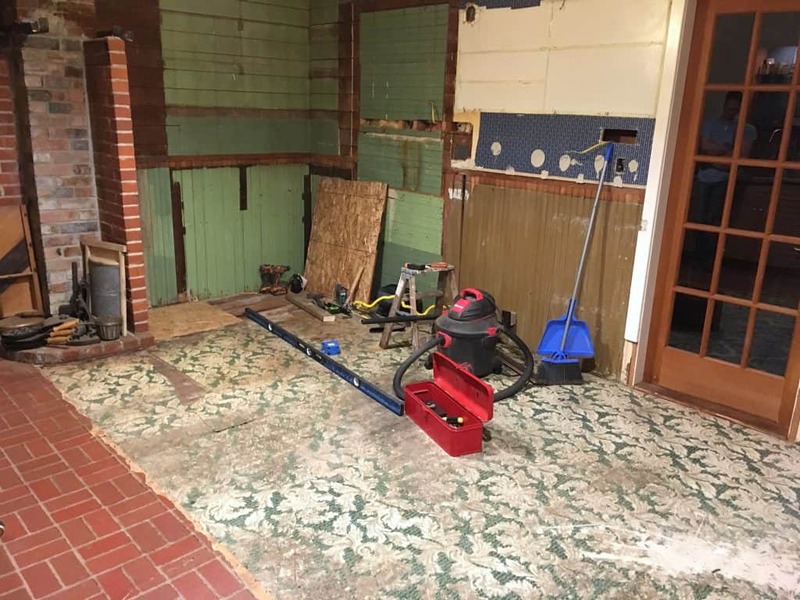 Welcome to Part II of the 1912 Modern Farmhouse Kitchen Remodel! For those of you who are joining us for the first time, this is the second installment of our DIY kitchen remodel series. 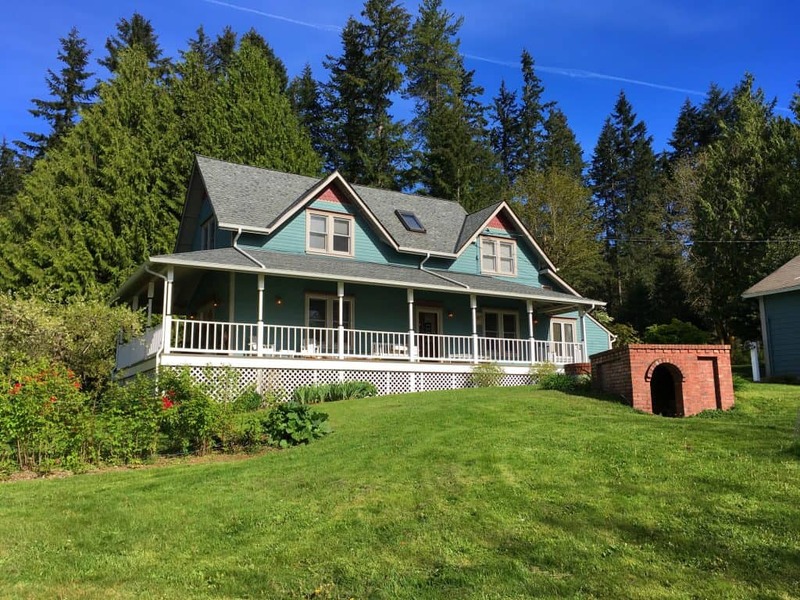 We bought our 106-year-old home two years ago and after spending the first year remodeling a tiny guesthouse on our property – an insanely challenging undertaking! (see The Micro-Dwelling Project) – our next project was tackling our main kitchen. Our historic home was in immaculate condition when we bought it and fortunately the kitchen was the only thing that needed updating. In our first post we take you through the complete demolition process. 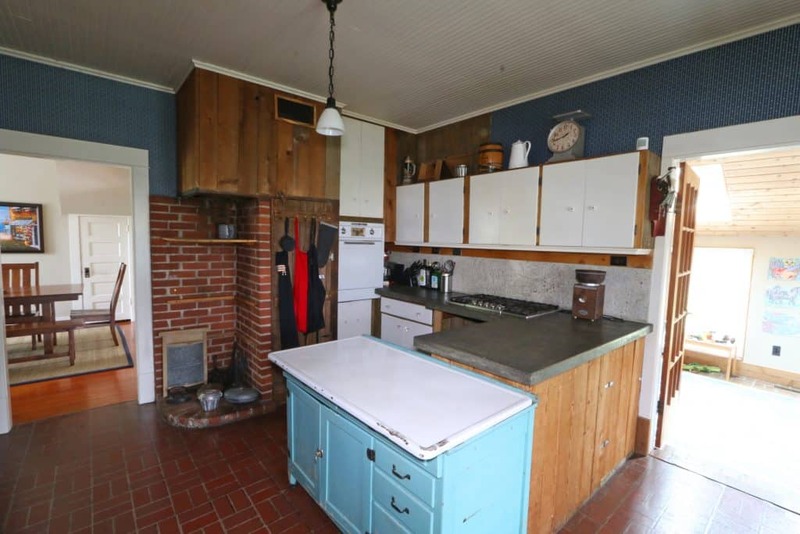 See The 1912 Modern Farmhouse Kitchen Remodel: The Demolition. In our demolition post we also provided all the background information about the kitchen, its unique elements and our vision for the remodel – combining the original elements for a blend of historic and contemporary. Our vision was a modern, contemporary, efficient kitchen that incorporated the kitchen’s original historic elements and used a blend of traditional, natural materials that were true to the time period of the house. These included materials like soapstone, copper, hardwood, marble, butcher block and brick. We had the kitchen cabinets and layout designed by a professional and then set about to do the rest by ourselves. Let’s take another walk through the original kitchen and then I’ll show you what we came up with. Everything ripped out and the remodel is ready to begin! The chimney was rebuilt up to the ceiling and we put new crown molding all around the whole kitchen. We added some iron hardware to the chimney where we’ll be adding glass shelves for some colorful decorative items. Double wall ovens and cabinets took the place of the old chicken coop door closet. FYI, we’re still in the process of mortar-washing the bricks to make them uniform in appearance. 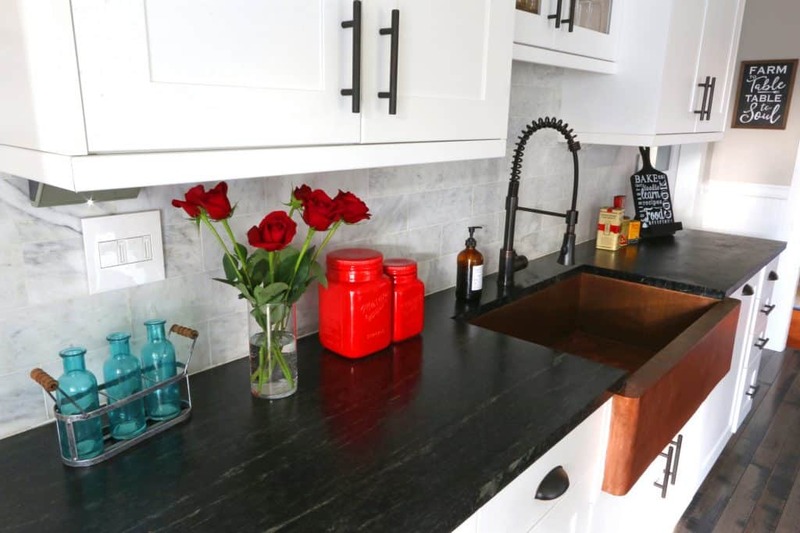 We installed soapstone countertops and a copper farmhouse sink with an oil-rubbed bronze faucet and matching hardware throughout the kitchen. 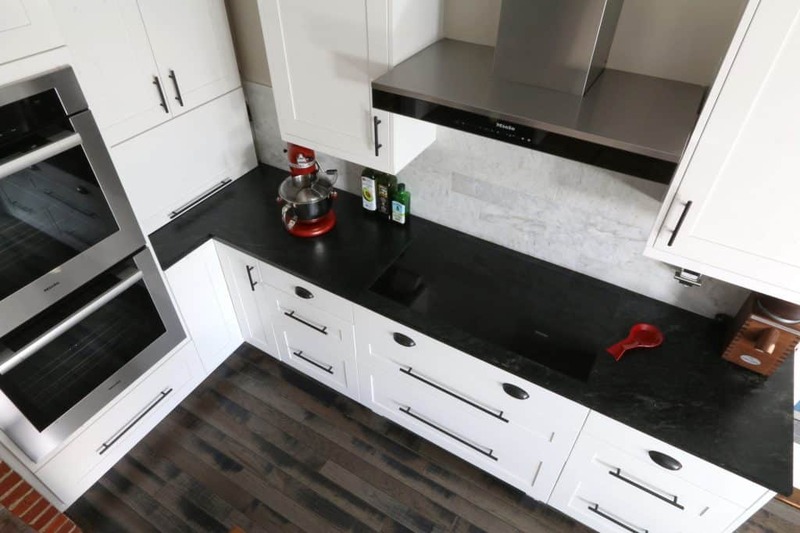 We purchased our soapstone countertops from Vermont Soapstone which has been around since 1856. 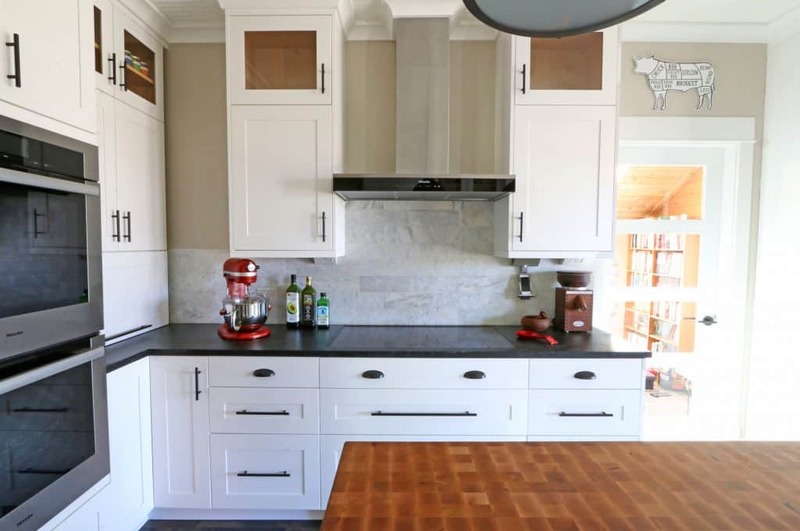 Soapstone countertops, which are now regaining popularity, were more common in the early 20th century when this home was built (even more so on the East Coast), and they were our first choice from the get-go. Soapstone has really unique properties that makes it a great choice – it’s not affected by heat (you can set hot pans directly on it), it doesn’t stain, and it’s non-porous so it doesn’t harbor things that would attract bacteria – and it’s just downright gorgeous. After our experience with Bellmont Kitchen Cabinets in our guesthouse kitchen remodel, we already knew wanted to go with their cabinets for our main kitchen, this time choosing their 1900 series. We wanted to go with a timeless look and chose Shaker style in white. Not only is white classic but with our covered porch blocking out a lot of daylight, we needed to add more brightness to our kitchen. We love our Bellmont cabinets. 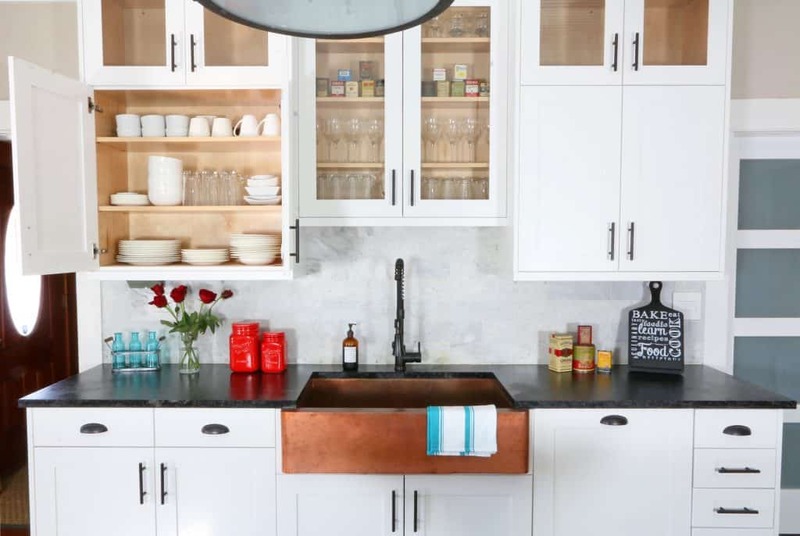 We chose a modern farmhouse copper sink from CopperSmith which we absolutely love. We chose one with a bright raw finish which looks really cool but are now letting it develop its natural rich patina. At any point the sink can be scrubbed back to it’s original bright copper state. We chose marble for our backsplash, another timeless material that is both traditional and contemporary. We chose wider/longer tiles for a more modern look. Since marble is highly porous, we used as a stone sealer to prevent staining. We wanted sleek, contemporary light switches and outlets as well as under-cabinet lighting and based on our experience with the adorne® Collection by Legrand for our guesthouse kitchen remodel we wanted to use them again for our main kitchen. (Check out our review of the adorne® Collection in our main kitchen. We also added recessed lighting throughout the kitchen, the one item we hired out to an electrician. The original kitchen had no refrigerator in it, the fridge was located in the pantry off the kitchen. So we built in another fridge and added more cabinets around it, making good use out of that corner where the antique Hoosier used to be. A Note About Paint: We wanted to go with a gray-toned paint for the kitchen and tried out no less than 4 different shades of Benjamin Moore. We thought we had finally found a true gray but as is the nature of paint, it’s very different depending on the time of day and lighting. Sooo…we’re back to the drawing board on this one. If you have any recommendations we’d love to hear them! Absolutely nothing. But since we got him right after it was completed (and he jumped into the photo shoot for snack), and since one of our readers, Patty, left a comment on our kitchen demolition blog post requesting to see a picture of our pup, we thought we’d go ahead and introduce him. Meet Huxley, our adorable and good-natured 12-week-old Treeing Walker Coonhound. Once full grown he will be 60-70 pounds which practically makes him a major kitchen appliance in his own right. Alright, back to the kitchen! 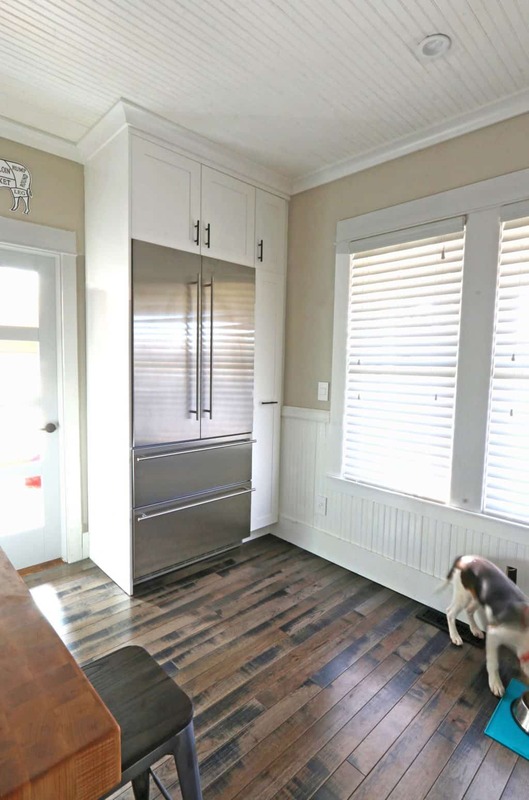 We knew we wanted to go with hardwood flooring for our kitchen. It’s timeless, true to the historic time period of our home, is merciful on dropped dishes (less shattered china! ), and in our opinion there simply is no material more beautiful than real hardwood. Based on our experience with the flooring in our guesthouse, we knew we wanted to use Armstrong Flooring again for our kitchen. We had envisioned a hardwood that was both rustic and gray-scale, providing that balance of traditional and contemporary and Armstrong had exactly what we were looking for. Read all about our flooring installation! 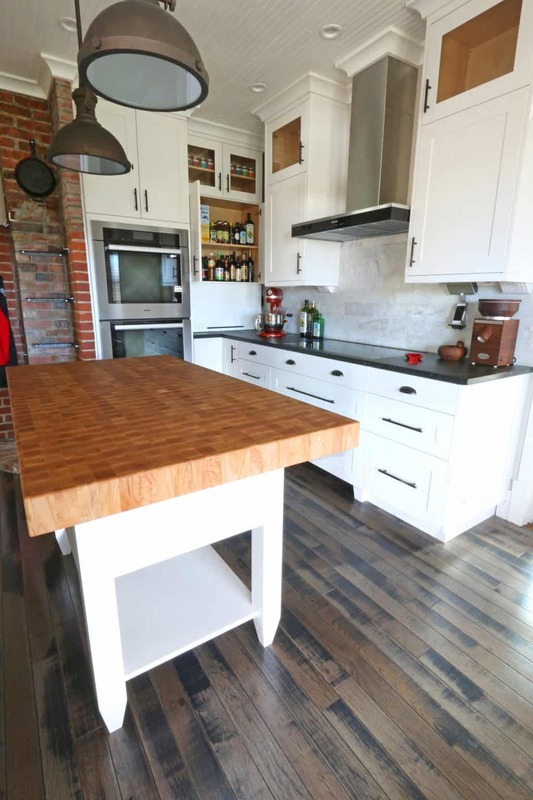 We chose butcher block for our kitchen island. Can I just say that you can never go wrong with butcher block! It fits both traditional and contemporary settings and it’s downright gorgeous! We knew we wanted to use John Boos who has been making the finest butcher blocks in the USA since 1887. As the centerpiece of our kitchen and my primary workspace, we couldn’t be happier with it. 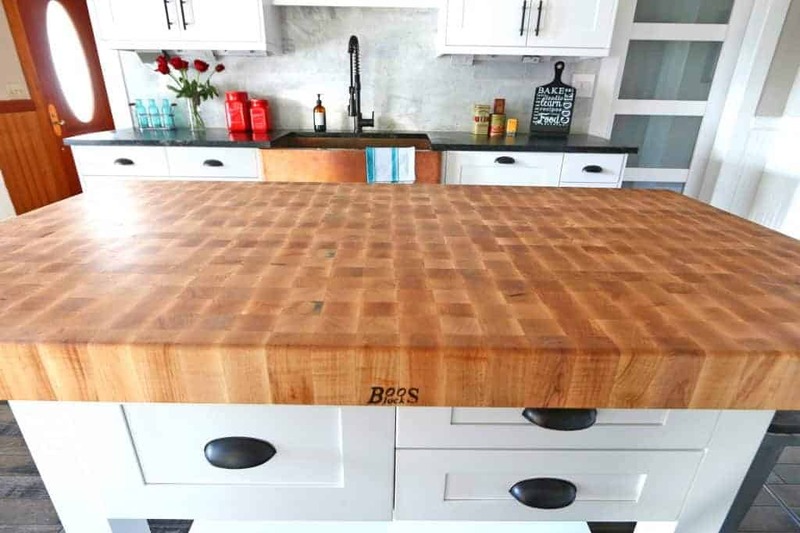 Read more about experience with John Boos and all about butcher blocks! I have a few things staged temporarily for the photo shoot and I’m still in the process of moving my things back into the kitchen (the upper glass cabinets are still empty). With all the white and gray in the kitchen the decor will need to provide an abundant amount of color. I have a lot of ideas for the decor and there are so many directions this could go – I can’t wait to get started! 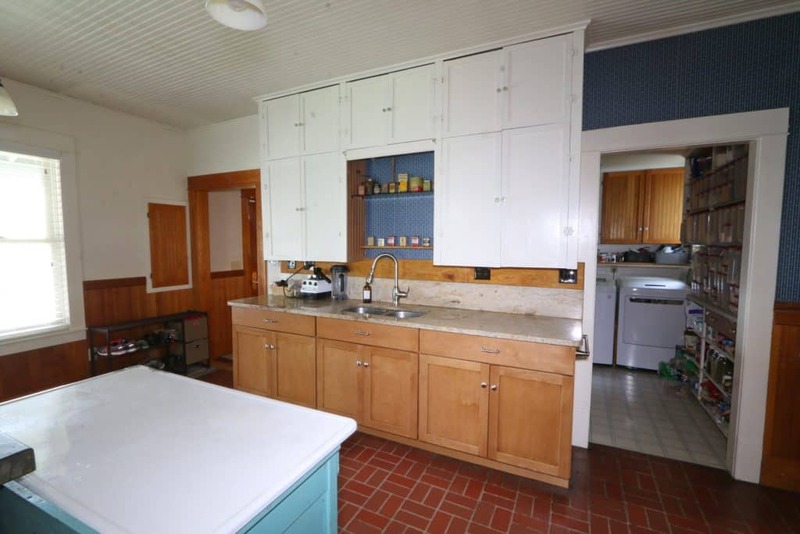 As with our DIY guesthouse remodel, we tackled this kitchen remodel entirely by ourselves. We had the kitchen designed by a professional and then proceeded to do the entire remodel ourselves except for some of the electrical work that we hired out to an electrician. 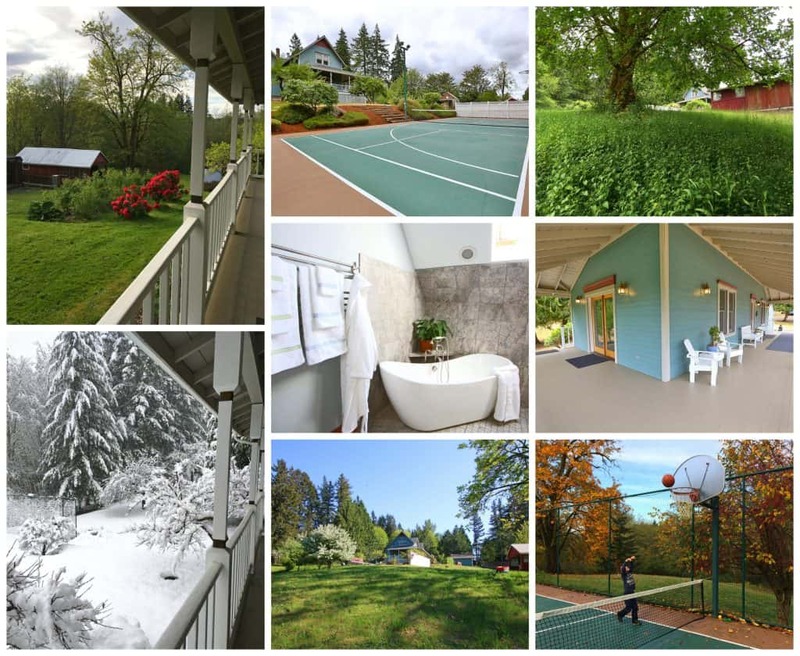 The only prior experience we had had was our guesthouse remodel. I am still in awe and feel so incredibly lucky to have a husband who is so talented. Go Todd! 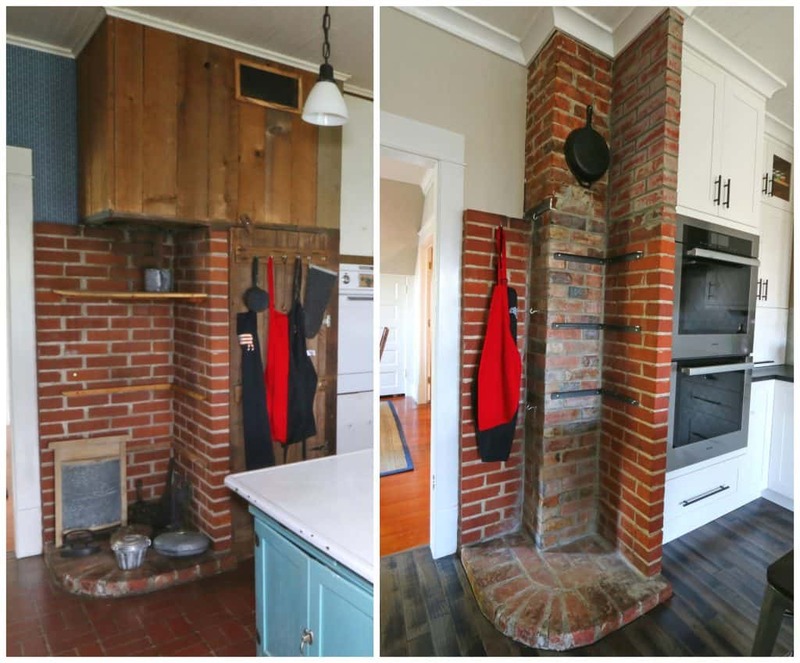 SO much went into the process of our historic kitchen remodel and in the upcoming installments we’ll be sharing the step-by-step details with you! Thanks for joining us and we look forward to seeing you next time! A special thank you to our partners Bellmont Kitchen Cabinet Co., Miele, Armstrong Flooring, John Boos, CopperSmith and Legrand! *as my jaw hits the ground* WOW!!! You guys did such an incredible job, I am in absolute awe! I love ALL of your choices! All I can say is BEAUTIFUL and WELL DONE! Oh my goodness, WOW!! This looks like something from a magazine! You both should be so proud of yourselves and Todd is one talented man, especially to have done this with no prior experience. Amazing job you guys, it is beautiful! Absolutely stunning, I love it!!!! What a gorgeous kitchen, you guys are incredible! I love your choice of all the materials, they came together so beautifully. 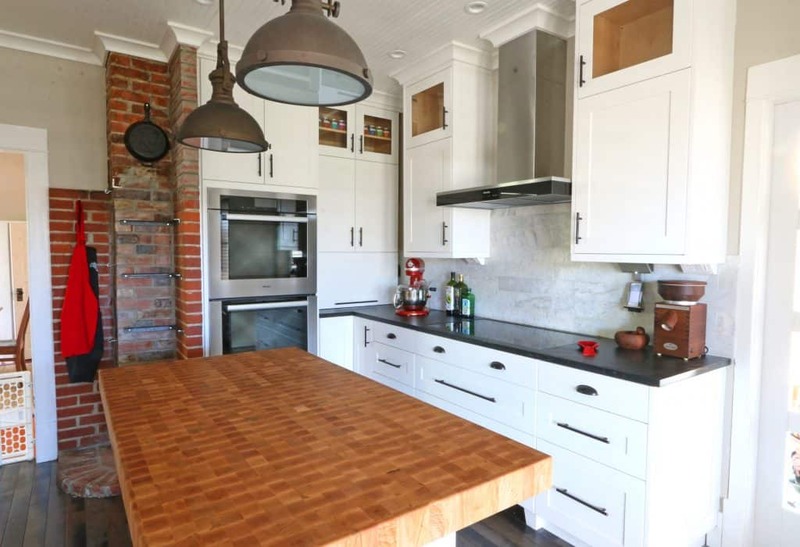 LOVE that gorgeous butcher block! Well done on this you two, you deserve this stunning end result!! Beautiful and still has the old charm to it! You did an outstanding job! STUNNING!! This belongs in a magazine! Perfectly beautiful! You’ve done a magnificent job, and I would love to have a kitchen like this! In response to your request for suggestions on the paint, I think any grey would be too much grey tone; I also think it can look ‘dirty’ when it isn’t, and although it has been popular now, I think that is close to done. I would consider a light cream, like a sunlit white, instead. Cream and white are classic, and I think it would enhance the beauty of your flooring, brick, and everything else. All accent colors look good against cream. My wife kept poking me in the ribs while we were reading through this. Could it be she’s hinting at a remodel? :) She’s been talking about taking the direction of a modern farmhouse kitchen also and we both love what you’ve done with yours. Love the traditional materials you’ve used and the contemporary/rustic Armstrong flooring is just beautiful, my wife had me blow up the screen to take a better look. We’re both looking forward to reading more details about your kitchen in your upcoming breakdown posts. Absolutely beautiful! You made such great choices for everything and I love the blend of contemporary and classic/traditional. Your kitchen space was a challenge to work with, with all the doors and windows but you made the best use of the layout and the kitchen is just stunning. Truly a remarkable job, well done! Wow! What a fantastic transformation!! All your hard work definitely paid off. I love the copper sink…. 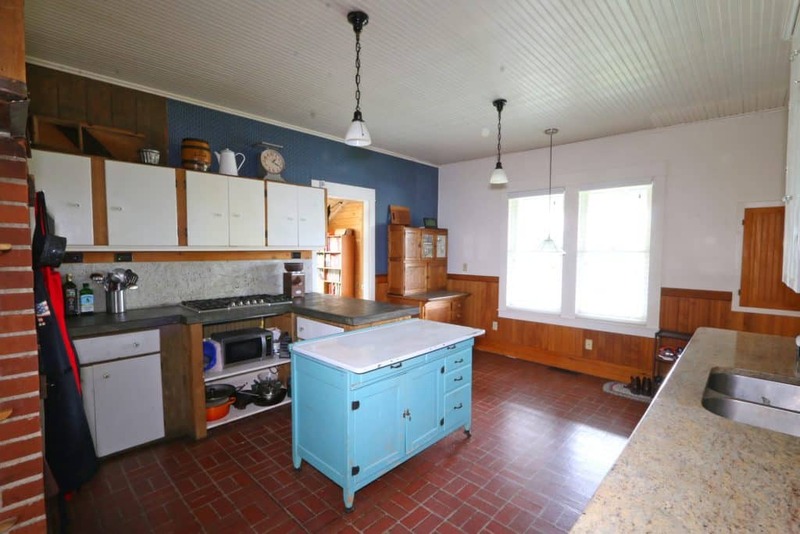 and the counter tops… and the butcher block and I can go on and on!! You guys did a great job! I am in love!! I am soooo jealous of that sink! That island is amazing too! Puppy is adorable too! Kimberly, your kitchen is absolutely gorgeous! I love love love the copper sink. Stunning. 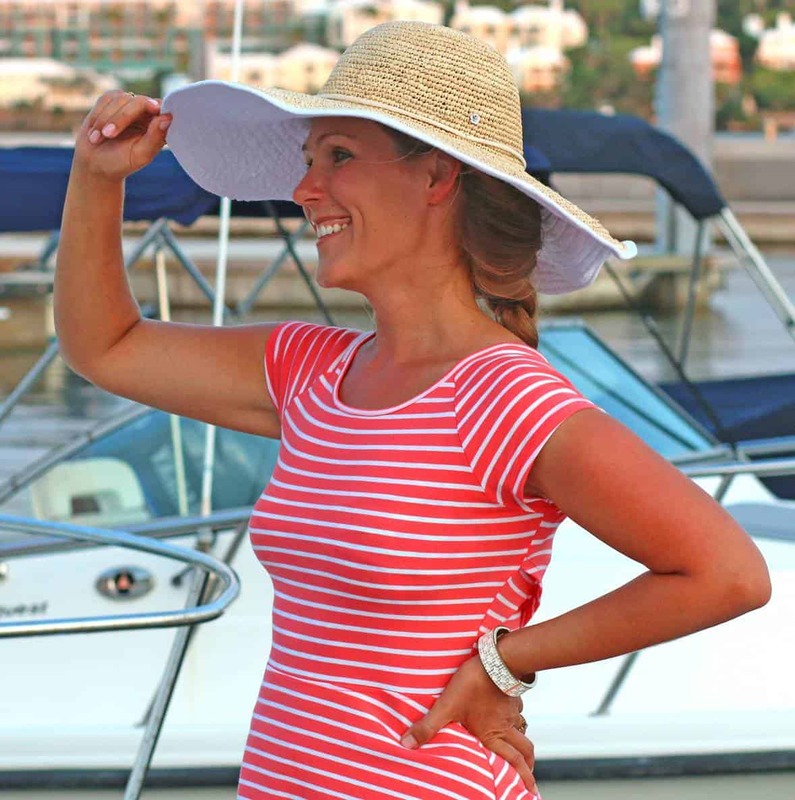 The butcher block island is my favorite! Gorgeous! 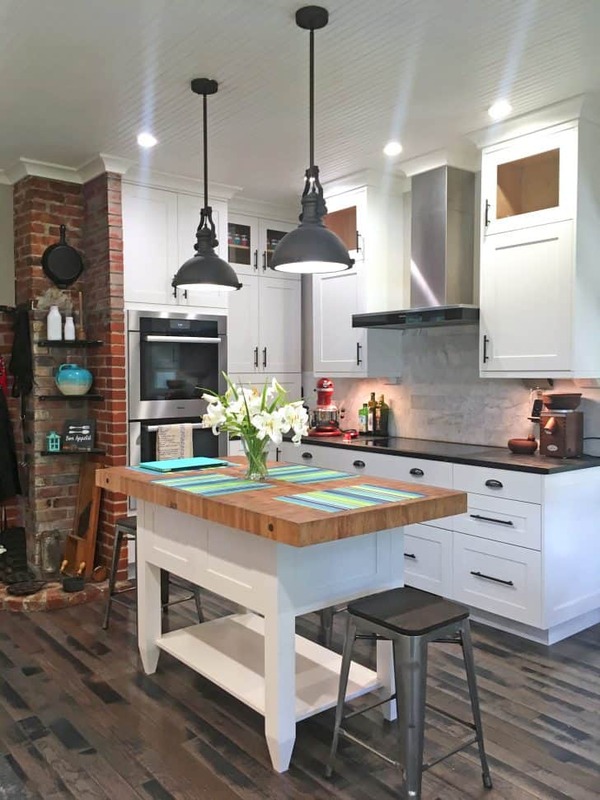 Congratulations, your kitchen is wonderful:) Wall color can be challenging: you have warm colors with your butcher block and brick, and copper sink. Your floor has cool brown and black, w/ black counters. My suggestion is to Start with a lot of unbleached titanium and add cinnamon and some black to get a very light, natural shade of a warmer color than just gray. You might be having trouble with the gray because it needs a little more of a warm brown…? In any case: everything is lovely and Best of Luck with all the final touches! Simply gorgeous!!! 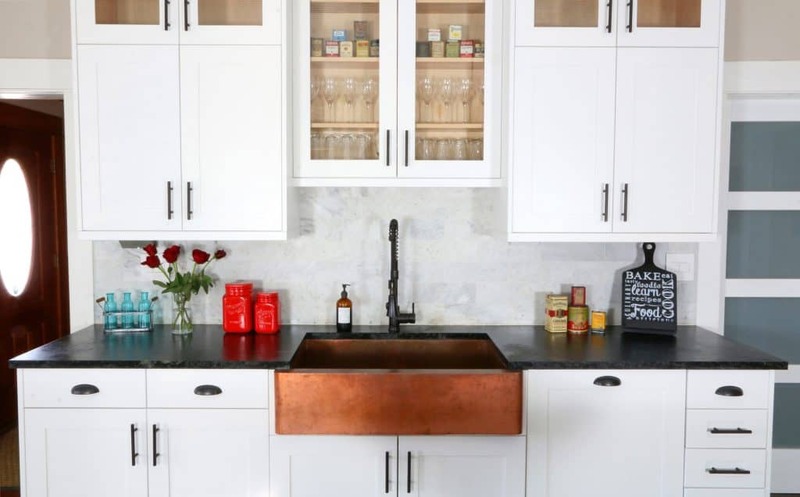 And that copper sink has me swooning!! Love it! Wow! That is awesome. I love the fact you have traditional features yet with a modern twist. Very sympathetic to the age of the house, well done! Very wise whether intentional or not living in your house before doing such a large renovation, I have found it gives the opportunity to see what functions and what would improve the space and make it work better. You did a magnificent job blending all these aspects and kept with the age of the house, now it reflects you. Sometimes people are in such a hurry to make things look better costly mistakes are made. The paint color will come to you, and it will be the color you least expect, what’s your favorite color, sometimes that can be a good place to start. Job well done, I also have a husband who can do anything, sure saves on labor costs. Cute puppy, nice addition to your family. Cook great things in that kitchen, it seems you spend a lot of time in there, now take a vacation and let someone else cook for you, you have earned it after all that hard work. GORGEOUS!!! Thanks for sharing all of this! What a beautiful transformation. That sink is stunning. That is such an amazing transformation!! Love, love, LOVE it!!!!! Love ALL of your choices and you did such a beautiful job, congrats!! I cannot get over how gorgeous this transformation is! Loving all the crown molding!! That is a great change! Your kitchen looks great! OH my gosh it looks gorgeous!! We are redoing our kitchen right now (Just started) so I got some good ideas from this! It’s gorgeous!! I love the finishes and the final look and your pup is tooooo cute! Wow! This is totally amazing! I really love how it turned out! You did a great job! Love it all, especially that you have Miele appliances! You are going to FLIP with the dishwasher!! I am still in love with mine and every day it’s such a joy to use. I cannot recommend it enough! Enjoy your new kitchen, you deserve a lovely place to cook and bake!